With December’s arrival, it is now undeniably and officially Christmas season; and that means the deluge of cookie-baking that commences around this time every year can begin. Yay! I don’t know about you, but I’m pumped. 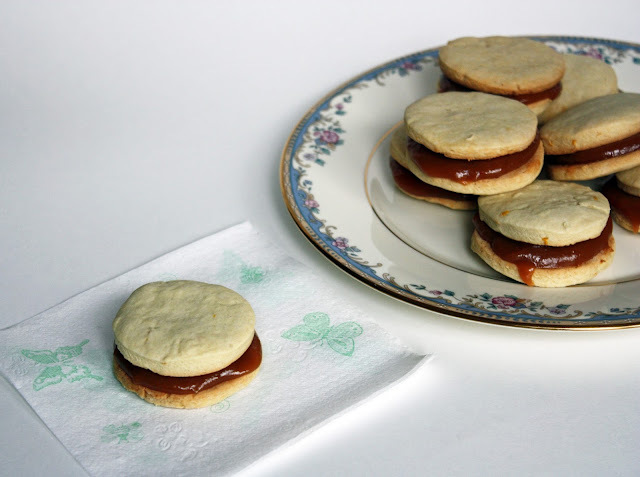 To start things off, today I have for you a very special cookie recipe, based off the traditional Spanish / Latin American dessert called the alfajor. I’d been meaning to make these cookies for a while after seeing them around the blogosphere. So when I cooked up a nice batch of vegan dulce de leche, I decided to stick the leftovers (after using some in a very special cake) in between two cookies and call them alfajores. 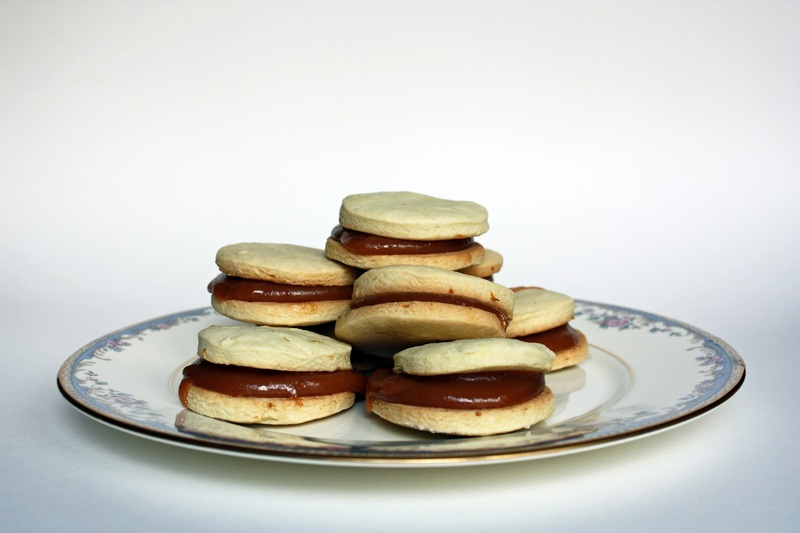 Alfajores, as it turns out, have a long history in Spain. According to Wikipedia, one recipe from 1786, which uses “natural ingredients that include honey, almonds, hazelnuts, sugar, flour, and breadcrumbs” as well as “natural spices”, is still being manufactured. It is possible the word itself, if not the dessert’s modern iteration, dates back to the 12th and 13th centuries. I mean, that’s crazy. That is some ancient history. I’m pretty sure they didn’t even have internet back then. 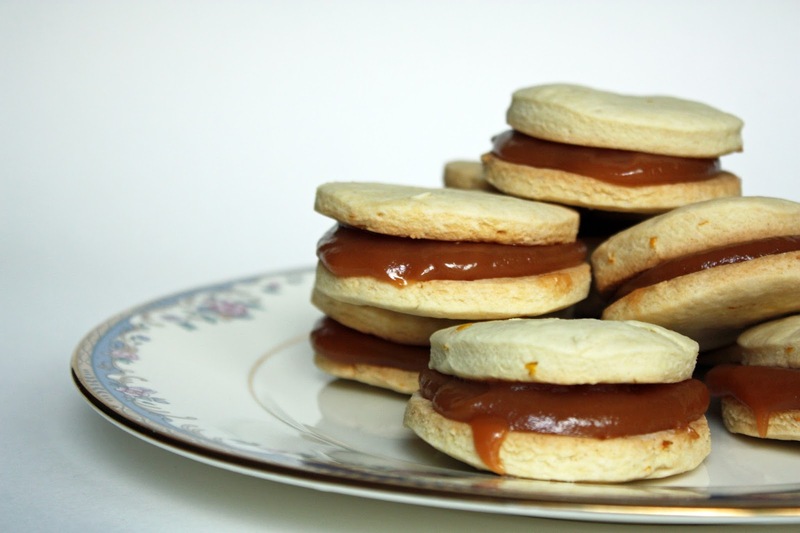 Today, the most popular variation (at least in this country) involves two shortbread-like cookies with a generous dollop of caramel-like dulce de leche sandwiched between them, and maybe the whole thing is rolled in coconut, maybe not. I chose not to roll mine in coconut, since, knowing my luck, it would probably be very messy and not at all photogenic. The sandwiches were messy enough, with all that gooey dulce de leche. The cookies themselves aren’t just plain shortbread, however. They’ve got a little cornstarch, contributing to a unique almost cake-like texture, some lemon zest, and a bit of rum for extra flavor. The perfect match to rich milk caramel. Or milk jam, or whatever you call it. My cookies are on the larger side, but the recommended size is about that of an Oreo. Do whatever you like. I can’t stop you. It’s a free country, after all, and if you want to make alfajores 2 inches in diameter you can go right ahead. And, even better, you can change what fillings you want too. Adding chocolate chips? Folding in some espresso powder? Dabbing on some nutella? Why not? In a large bowl, whisk together flour, baking powder, baking soda, and salt. Sift in cornstarch and whisk to combine. Place vegan butter and granulated sugar in the bowl of an electric stand mixer. Cream until smooth and creamy. Add lemon zest and combine. Whisk together egg replacer and water in a small bowl until dissolved, then add to stand mixer and beat until light and fluffy. Add vanilla and rum and beat to combine. Slowly spoon in flour mixture, with mixer on low speed, until a dough forms. Do not over-mix. Wrap dough in plastic wrap and chill for 1 ½ hours. When ready to bake, preheat oven to 350 degrees F and line two baking sheets with parchment. Roll dough out to about 1/8-inch thick on a lightly floured work surface. Cut out circles of dough and arrange 1 inch apart on baking sheets. Bake for 8 to 12 minutes, depending on the size of your cookies, until just beginning to turn golden-brown. Let cool completely on a wire rack. 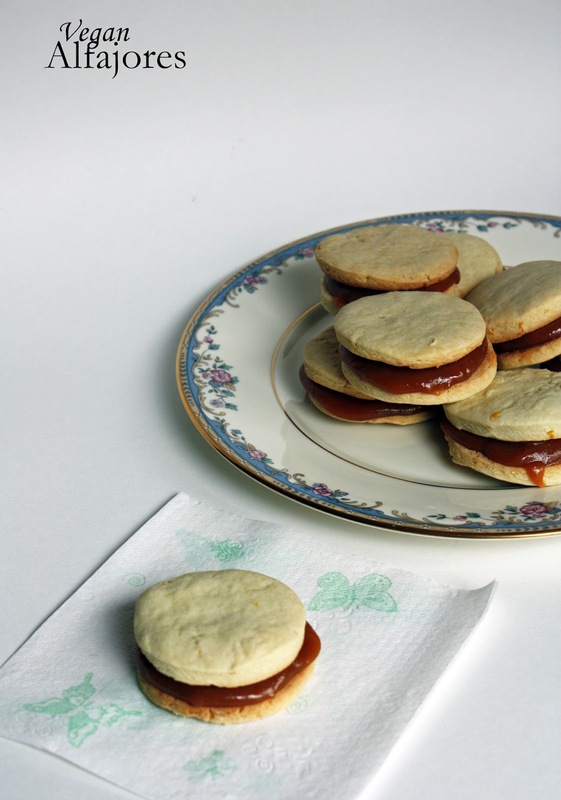 Fill cookies with a generous spoonful of vegan dulce de leche. Munch. For more totally Christmas-worthy cookies, click these links. Chocolate chip confetti cookies. The no-fail classic. Chocolate rugelach with cinnamon sugar. Because the love of dough rolled up in chocolate is universal. Cayenne macarons with chocolate ganache. If you like a little chocolate with your sugar and spice. Raspberry swirl rosewater meringues. Probably the lowest-calorie a cookie can get. Aaaand you're welcome! :P Guess you have no excuse not to make them now!! Perfect for this time of the year and perfect for my sweet craving. Loving the generous amount of Dulce de leche oozing out of the cookies...so delicious!